It's been about 4 months since my last update, and quite a few things have changed! 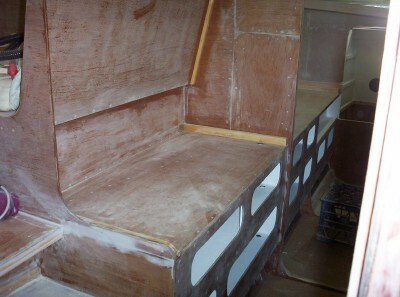 The foredeck is on, with holes cut out for the access hatches. 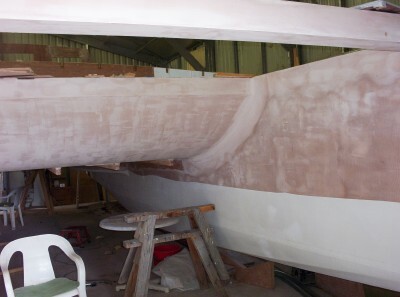 Some of the foredeck is faired, as is the beam. 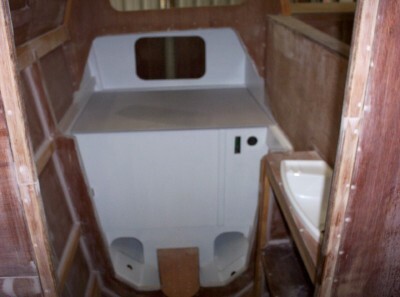 The rest cant be faired until the cabin top is on. The two cabins are finished, except for painting and upholstery There. will be a teak pinrail on the top shelf to keep things in. The toilet is ready for final installation (after the painting's finished). The holding tank and treatment plant is hidden behind/underneath the large shelf. The shower/vanity just needs a little more fill/sanding before being ready for painting. The toilet door's been hung but is currently removed for painting. The nav station area is also ready to paint, and I've started on the wiring plan. Most of the electrical switches, radios, etc. will be on the vertical panel at the back of the chart table. 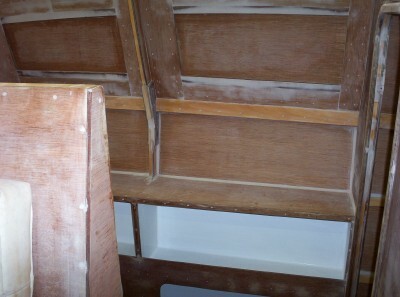 Holes are drilled in (hopefully) the right places to get all wiring and plumbing forward and aft in both hulls. 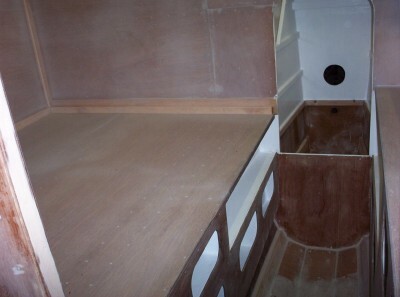 The galley is ready for painting. Rather than have a quarter berth, there's a pantry and fridge in the rear section of the hull. You can just make out the handle to the 120 litre built in fridge. According to my calculations it should only use about 15 watts of electricity, due to the 80-100mm of insulation. The bench tops will all be matching laminex in the galley / pantry, which will break up the monotony of the white interior. 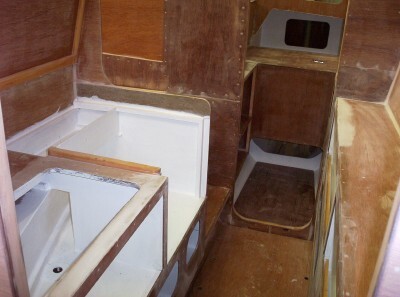 All the windows in the cabin sides are laid out. When things are painted inside, and faired outside, it will be a quick job with the router to cut out the window openings. It's amazing jost how long it takes to do the inside stuff - cutting timber and ply to the right sizes, and sometimes very complicated shapes - glueing, filling the holes, sanding, painting inside cupboards. Thankfully, that phase is coming to an end and I have now started work on the cabin roof.